Quick side note: Shalynne and I have been great online friends for a long time! She is such a sweet girl and I’m happy to call her such a good friend. We met online in about 2004 through LiveJournal, and have even met once! Please find the time to visit her blog and add her. You’d love her! Hello everybody! I’m guest blogging for Stephanie today while she is enjoying her honeymoon! I want to wish the new Mr. & Mrs. Wolfe all the best! 🙂 I’m Shay and I blog over at Wonderfully Chaotic about parenting, my life, homeschooling, marriage and a little of everything else. I have been married for six years and I have two kiddos, ages 6 and 2. My husband and I had a whirlwind courtship, engagement and wedding – we met in October and were married by March. We also had a child just a few short months after we got married. Things were pretty tumultuous for the first couple years of our marriage. The definition of tumultuous is excited, confused or disorderly; noisy. Yep…that sums it up pretty well! I am so glad to be in a place now where we understand each other and our roles within our marriage so well. We are not without our faults, though. We still bicker about things and argue from time to time but it’s nothing like when we first got married. We know what each of us want out of life and we’re pretty much on the same page about most issues. This nice stage of our marriage has taken a lot of time, thought and effort though. We have been through most things that it takes most people years to go through – having babies, moving, managing a blended family, unemployment, illness/health problems, and other stressful situations – but I wouldn’t change a thing. Through it all, we’ve learned a lot about each other and have grown a lot as a couple and as a family. A pastor spoke during a wedding service I recently attended on the “clothes” of marriage. She talked about how for our wedding day we put on our finest and best – generally a tuxedo or suit for the groom and a beautiful white wedding gown for the bride. 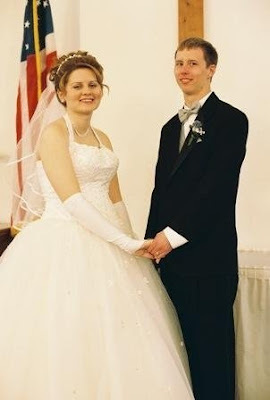 My wedding gown was a big poofy princess-type ballgown and I wore long gloves and a veil with it. – Being okay with who we are, warts and all. – Having someone to share your joys, challenges, happiness and struggles equally. – Being able to finish each other’s sentences and being able to communicate without speaking. – Knowing exactly what the other person likes or wants and what their goals for life are. What’s the most important thing you’ve learned about marriage and relationships?